This is home to quality and governance professionals and to our central logistics team, who drive our operations forward through data insight and state-of-the-art technology. Typical roles include Data Analyst, Service Delivery Advisor, Quality Coordinator and National Scheduler. Our engineering team focuses on supporting the automation strategy across our AAH branch network. Typical roles include Automation Developer, Technical Support Engineer and Engineering Project Manager. We’re all about the patient, not the product. 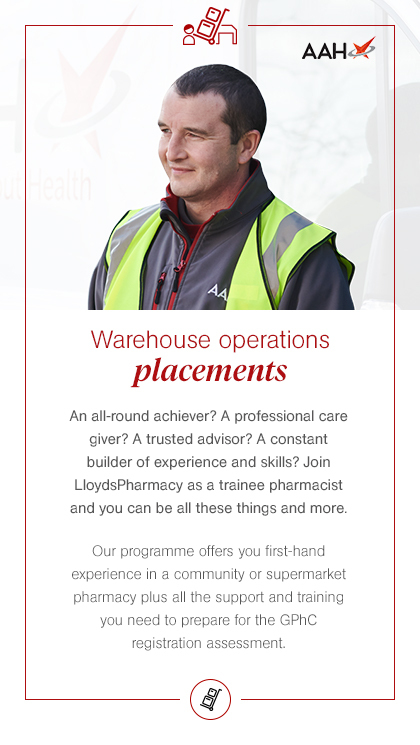 So if you want to build a career with the UK’s leading pharmaceutical wholesaler, you need to be as committed to going the extra mile for customers as you are to achieving your targets and goals. You’ll also need to be the kind of person who is always looking to improve things and who isn’t afraid to challenge the status quo. Explore opportunities across our business to find the perfect match for you.